It’s been a bit quiet on the old writing front of late, what with some sizeable changes going on in various aspects of my life. 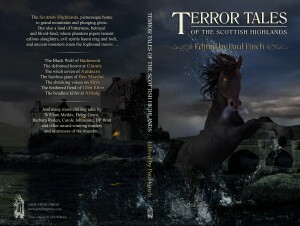 But now that I’m finally finding some time to get back into the swing of things, I’m very pleased to finally be able to announce that my story “Broken Spectres” will be appearing shortly in the Terror Tales of The Scottish Highlands anthology, edited by Paul Finch and published by Gray Friar Press later this month. I’m a big fan of this series of location themed horror anthologies and was overjoyed to be invited by Paul to contribute to this latest release. The Scottish Highlands are a spooky place at the best of times, offering a veritable smorgasbord of eerie locations from which to draw inspiration, and I had huge fun on this one from the first page to the last. The anthology is out in a few weeks time and I’ll add details of where you can get hold of a copy once I know more. Until then, here’s a sneak peak at the cover art and some of the writers involved. UPDATE (2015/06/15): The anthology is now available for preordering @ Amazon.com / Amazon.co.uk or directly from the publisher @ Gray Friar Press. Pricing and links also added to the Publications tab above.